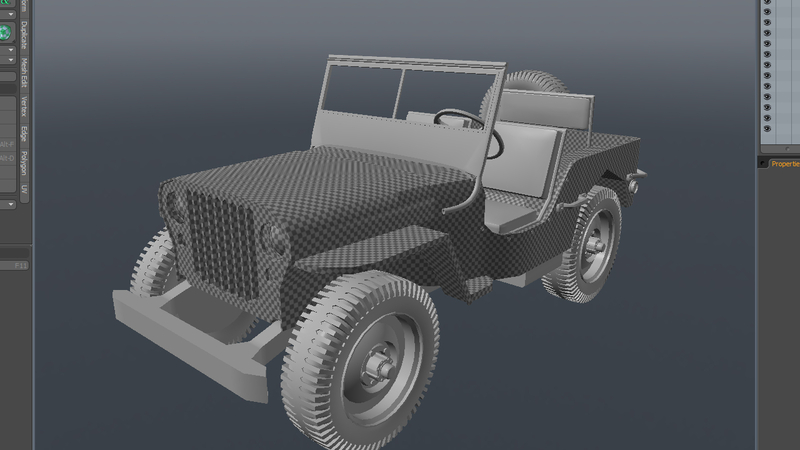 This post is part of a series called World War II Willys Jeep in Modo. 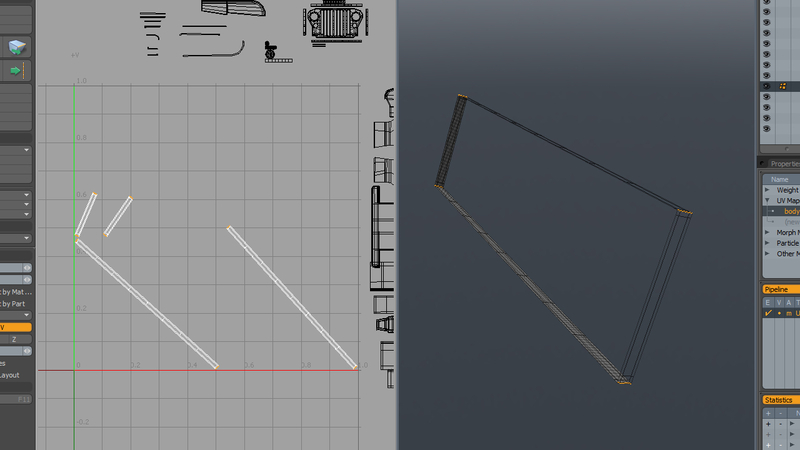 In Part 3, we'll continue mapping the remaining parts of the jeep. 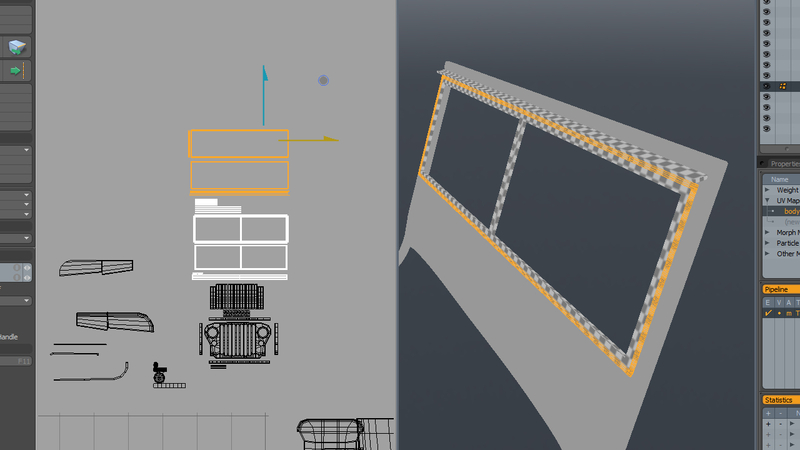 Our focus for this lesson will be unwrapping the front windshield and it's framing. 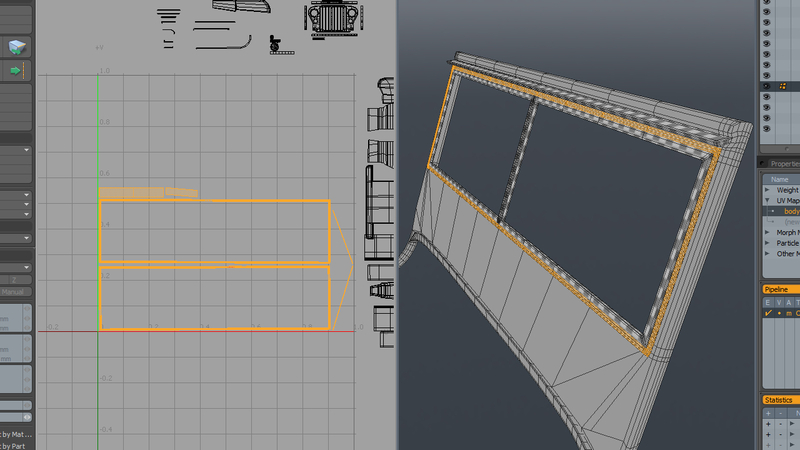 Since this part of the model is made up of several parts, it will take some time to flatten, stitch and pack the UVs correctly. 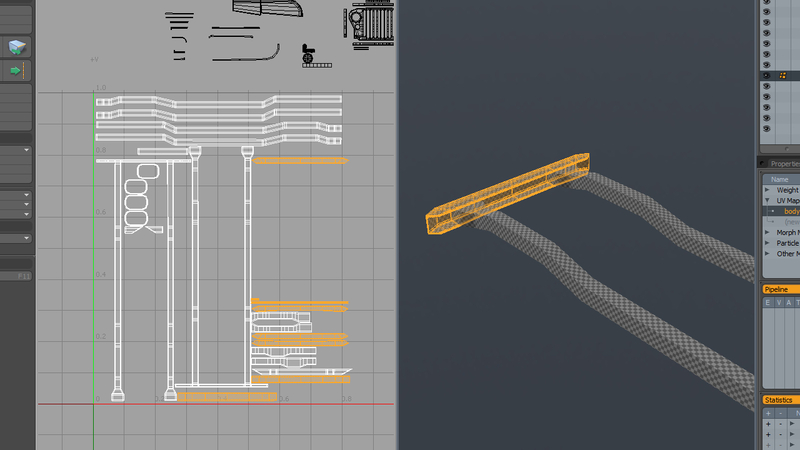 This tutorial will teach you how to unwrap a hard surface model. 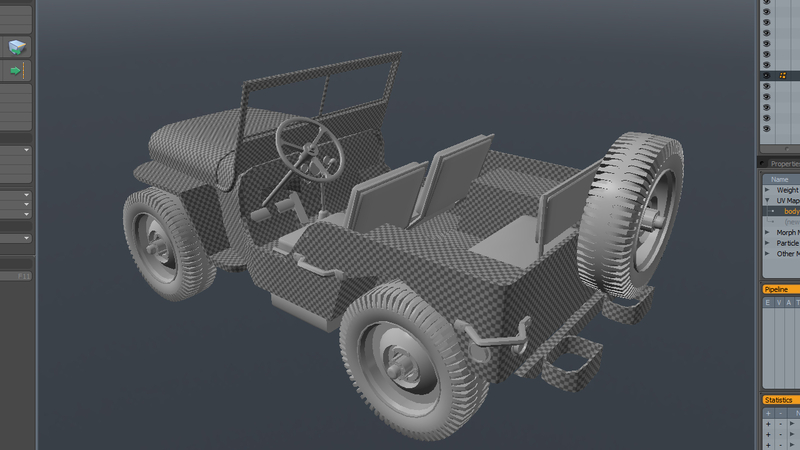 For that we will use the model from my previous “Modeling a High Poly World War II Willys Jeep in Modo” tutorial. 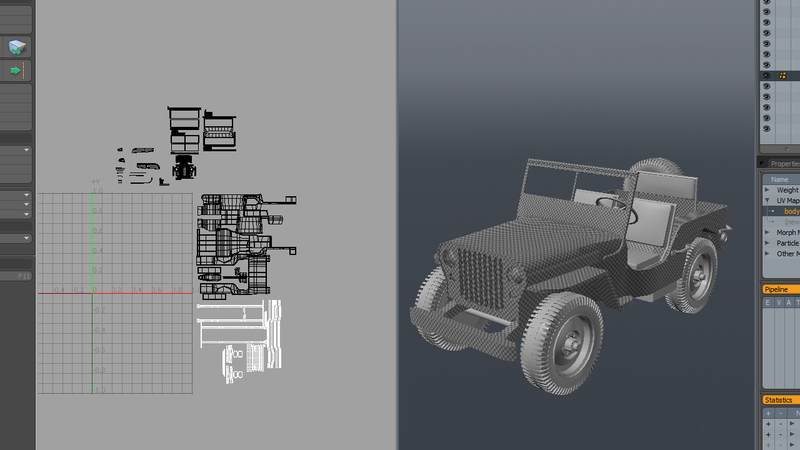 We will unwrap the Willys jeep using the default Modo tools and the ETEREA UV tools which are a great addition to the Modo toolset. For most people unwrapping is a tedious task. When you grasp the idea and learn the tools the process will become easy and comfortable. 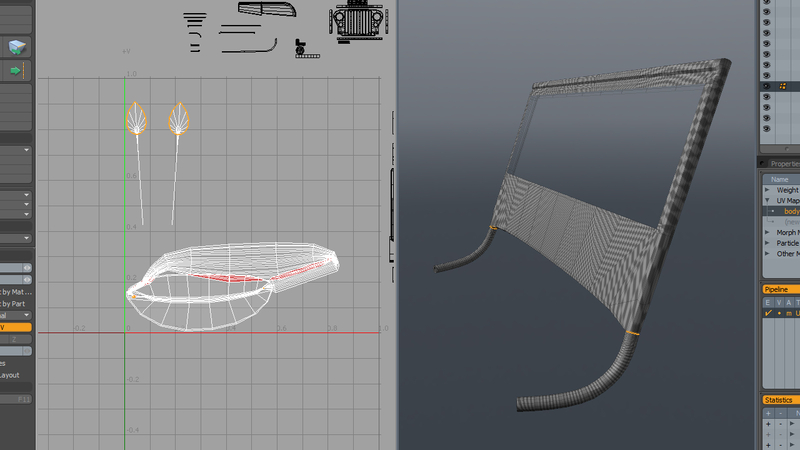 Modo helps in making the process smooth and painless. It gives you only a few tools, but they can easily get the job done. 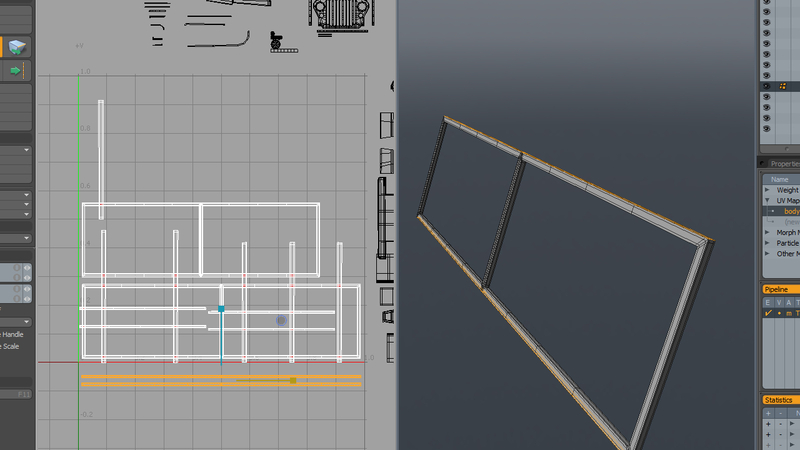 I hope that after you complete this tutorial you’ll understand the UVing process and will feel more comfortable unwrapping. 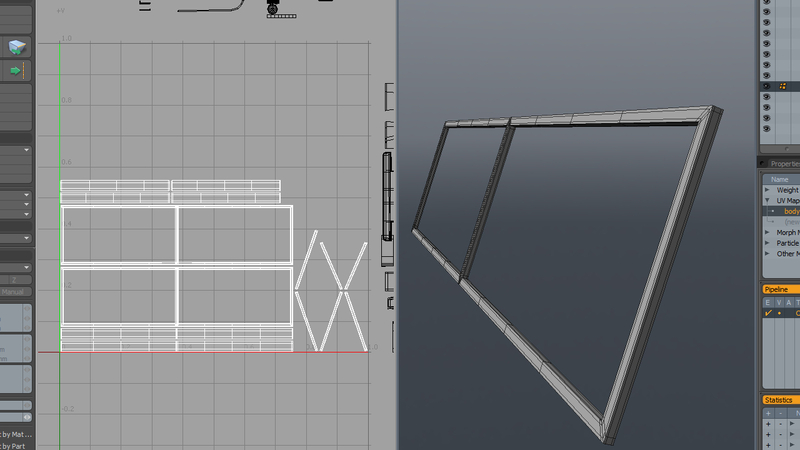 If you look now at our front window object it's made out of main piece (which we can separate in the main boxy shape and into pipes coming along the hood sides), rubber seal part, inner metal part holding the glass and small part perpendicular to the main shape acting as a small roof above the glass. 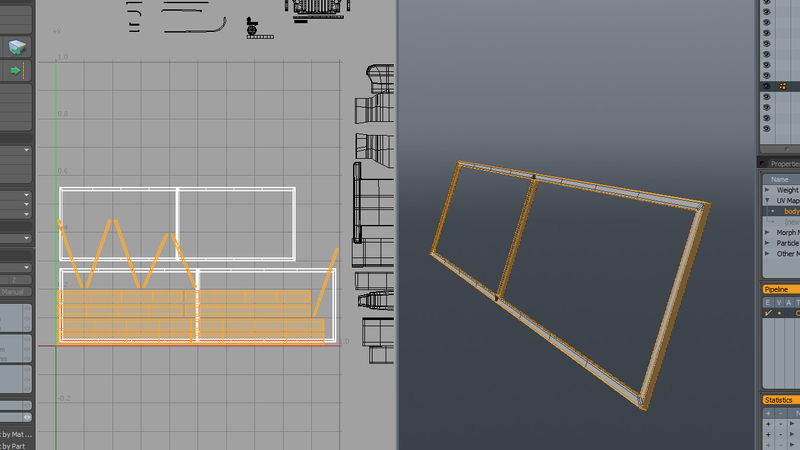 Remember to add your UV Map to the object. 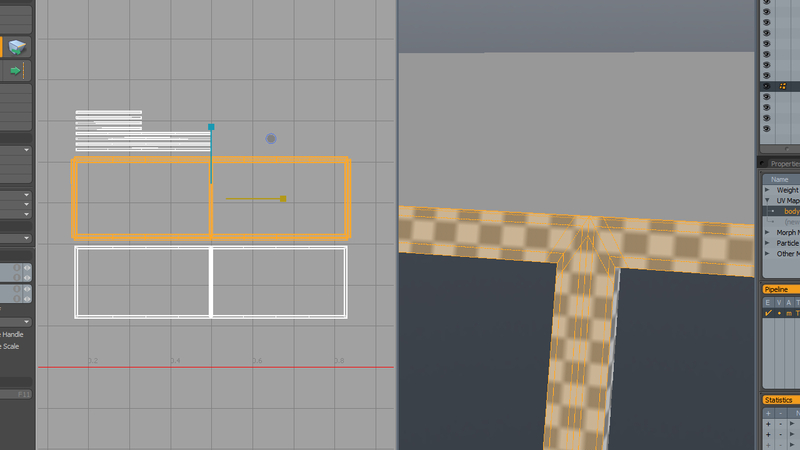 As you can see I'm still using the same uv map called 'body'. Let's start with the smallest and easiest part to unwrap. I've also hidden the rest of the object, so it doesn't obscure my view. 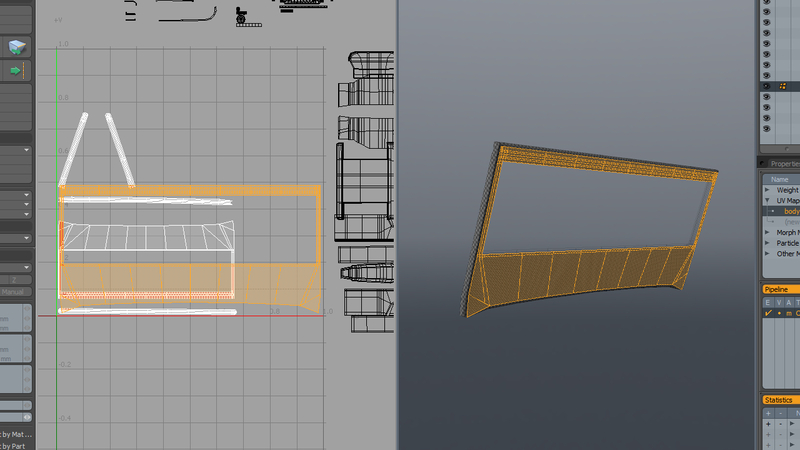 As you can see this part is pretty much a box shape. So let's try an automatic method. I used the UV Projection Tool with Atlas for the Projection Type. It gave me three big shells and two smaller ones for the caps. 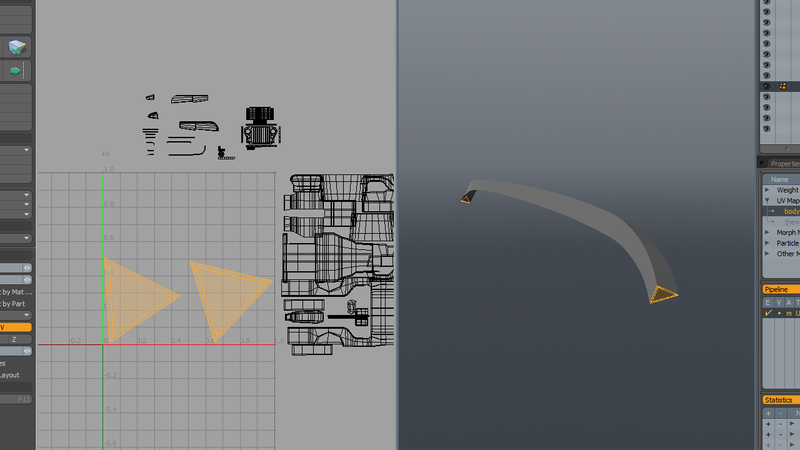 Looking at how this object appears in the 3d viewport, I can say I should have two taller shells and two smaller shells. One of the smaller ones is already stitched, But Modo didn't relax the second one properly. To fix this issue, first stitch the shells together. Select the edges as shown in the image and using one of the sewing methods we discussed in previous part, stitch them together. 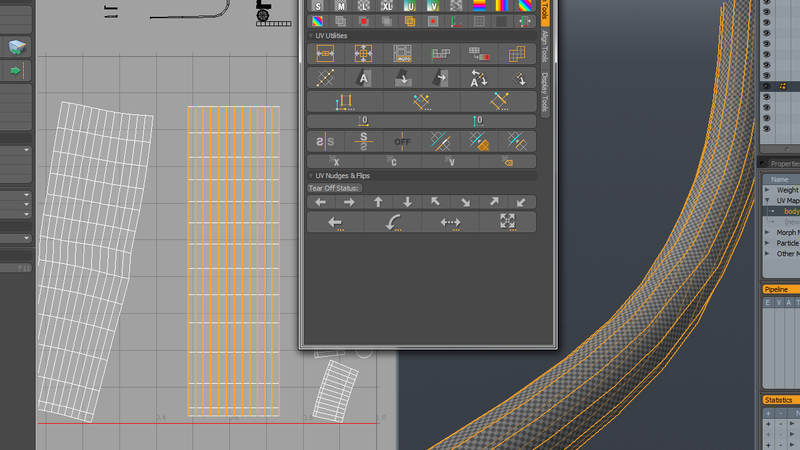 Now let's use the UV Relax tool. For this I'm using Unwrap as the relaxing mode. Align the shells horizontally, just as we did previously. Once again I'm using the ETEREAS scripts for this. Now place this shell somewhere outside the 0-1 space, and try to match the scale to the other shells. You can use the checker pattern to match the checker scale, or just scale it down while comparing it's size to the other shells. Now let's jump to the next part. Next, I unwrapped the frame around the glass. Once again it's an object built from flat planes. 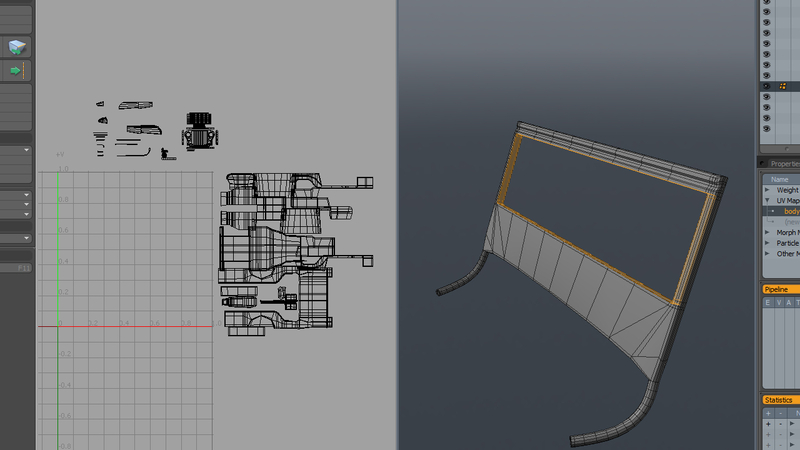 Let's once again use the UV Projection Tool with Atlas, as you can see some parts are way to wide. Relax those shells. Now you can see the shells look more like you would expect, but unfortunately they are now bent. Select the main planes of this object, as shown in the image. 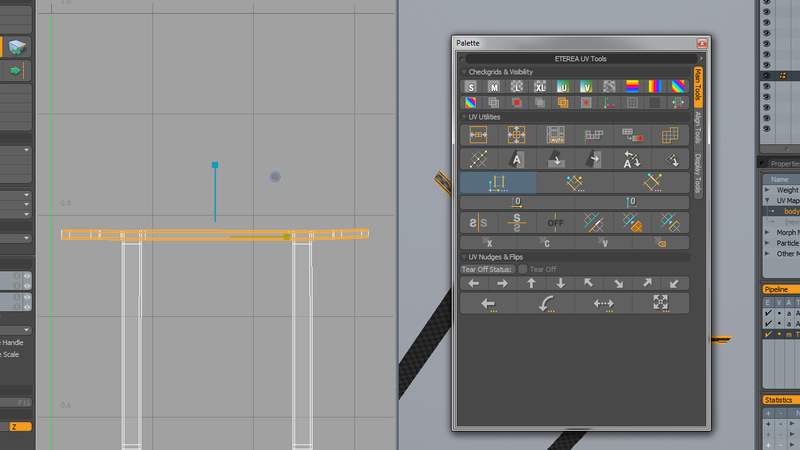 And once again use the UV Projection Tool. 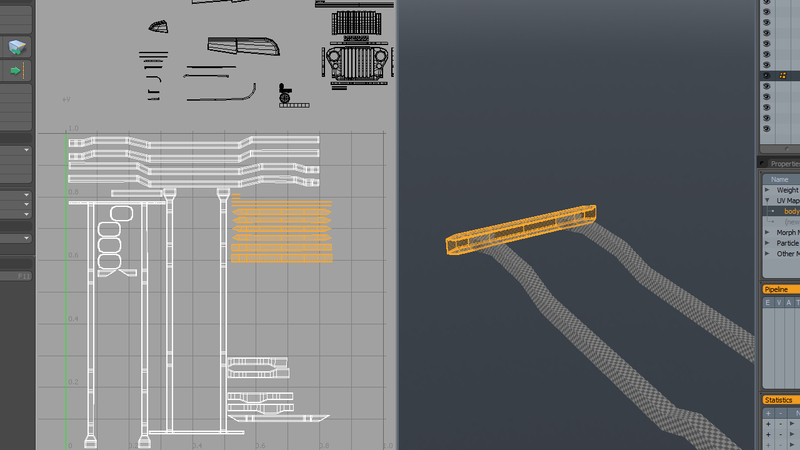 Now these parts don't need any more work, except for some Scaling. 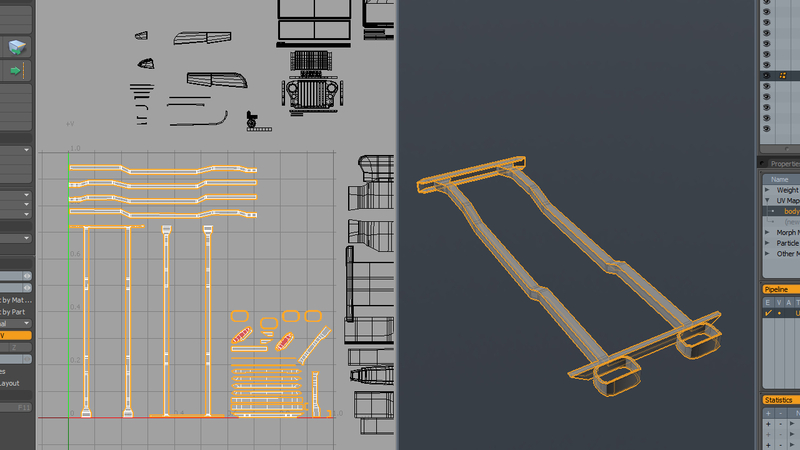 Sometimes it's worth trying to use the Atlas option on separate parts of the model. 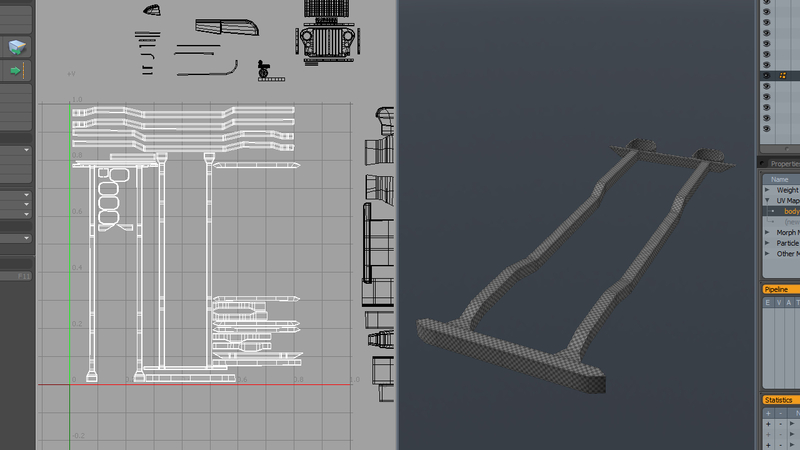 As you can see in the image, once again some parts are too fat. The advantage of this unwrap method is that we get really clean perpendicular edges, and we don't need to straighten the edges manually. But we still need to make them proportional without relaxing them. Lets just Scale the fat shells to match their height to the thickness of our object. 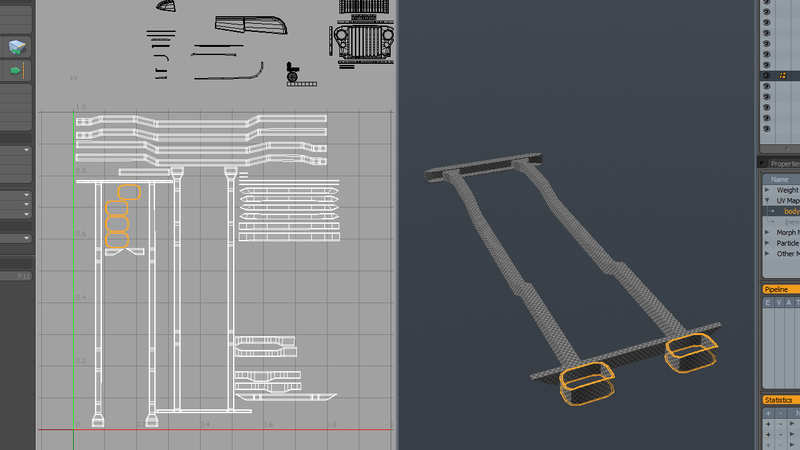 You can use the vertical parts as a reference. Remember they don't need to be perfect, and you can aid in Scaling with the checker pattern. I also vertically aligned some of the shells with the ETEREA script. 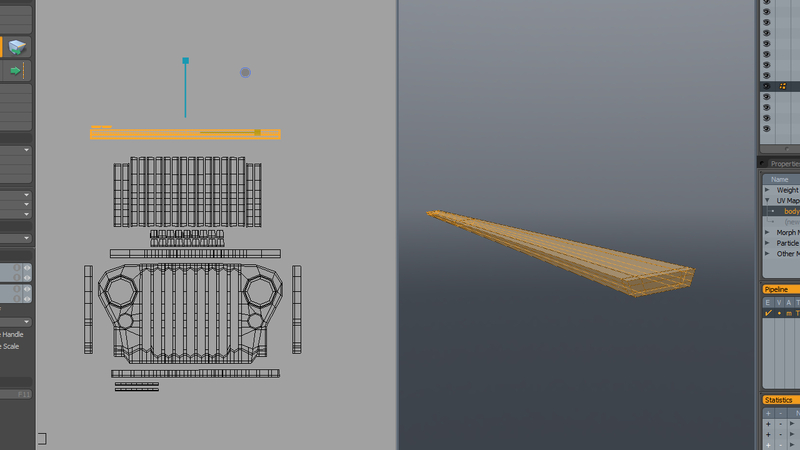 Let's use the Pack tool to make the Scale more uniform, and to pack some of the thin parts together. In the picture below, you can see that the scale of the front panel doesn't match the scale of the back. 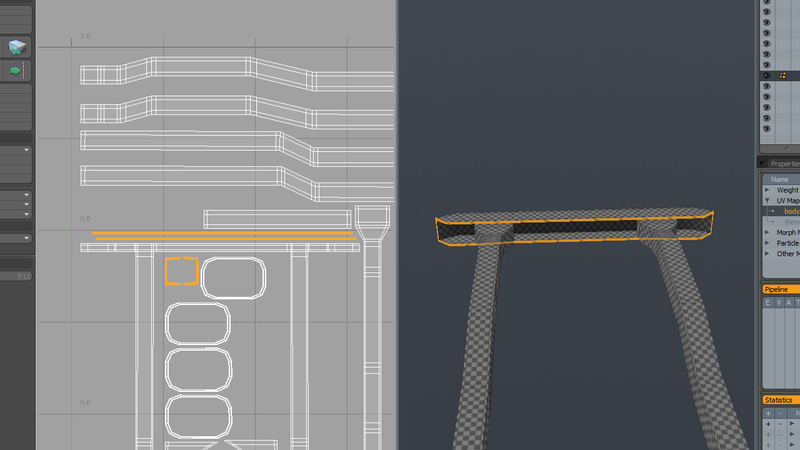 Later we will fix this, but for now let's reduce the seam amount. I start by Stitching both the top and bottom edges. Be sure you are Stitching to the front of the object, because a seam in the front will be more visible later and we want to avoid visible seams. 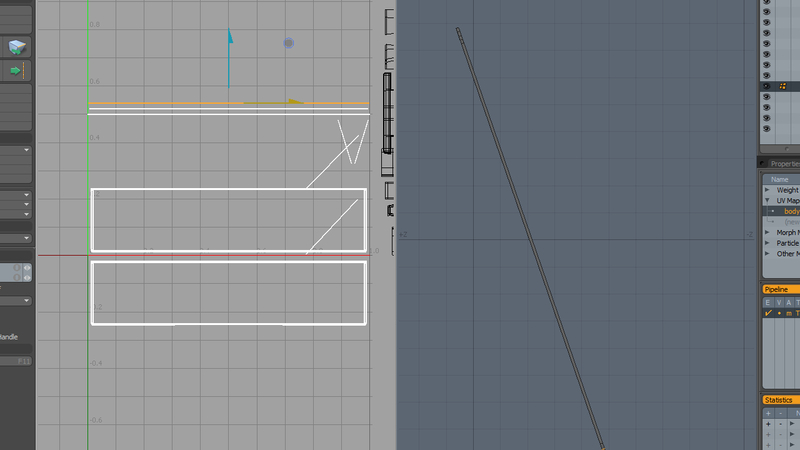 I also Stitched the side planes to the main piece. 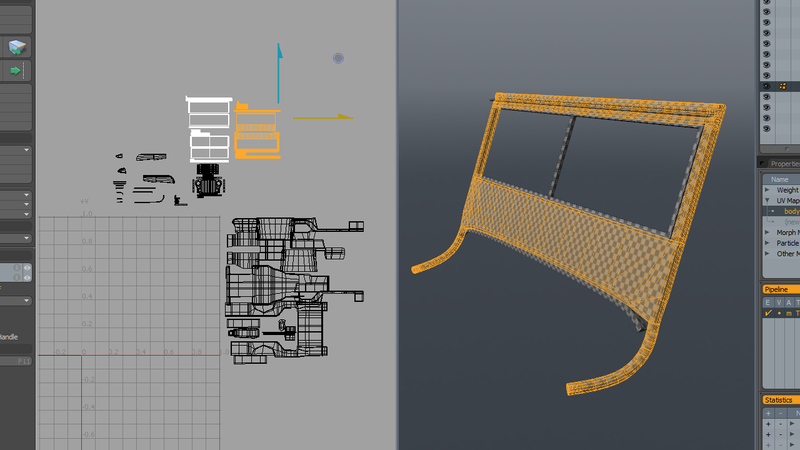 It's not possible to stitch the inner parts without adding distortion to the UVs. Seams inside won't be that visible though, so it's not a problem. 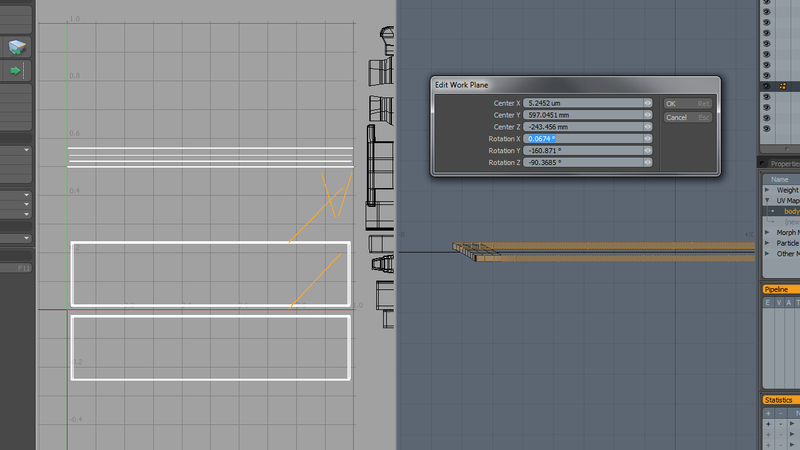 Using ETEREAS's Align Tools, I packed the inner pieces and spaced them out using a constant value. Place this object near the previously unwrapped parts. 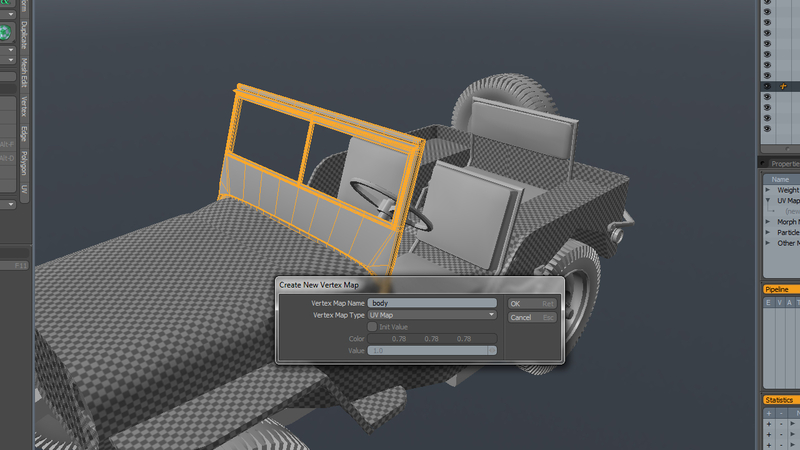 Try to match their Scale again by comparing checker sizes in the 3d viewport. The next part to unwrap is the rubber seal. Once again, I tried Atlas unwrapping. And once again the result needs fixing, but let's try something different this time. If I now activate the tool, it will break the object up into several shells. But unfortunately they are now bent and skewed. 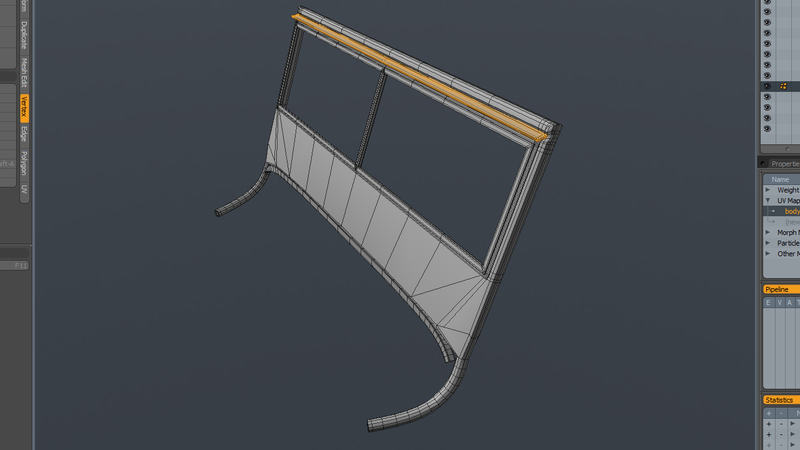 If your mesh is full of support edges, or your geometry has a few flaws. Sometimes automatic methods may fail. Let's once again use the Atlas option, but only for the front plane. ...and now the back plane. 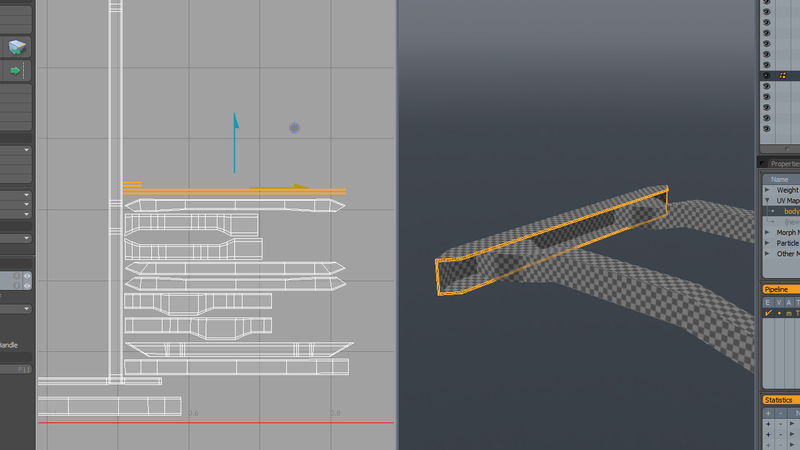 Be sure to not deselect the back plane after running the UV Projection Tool. 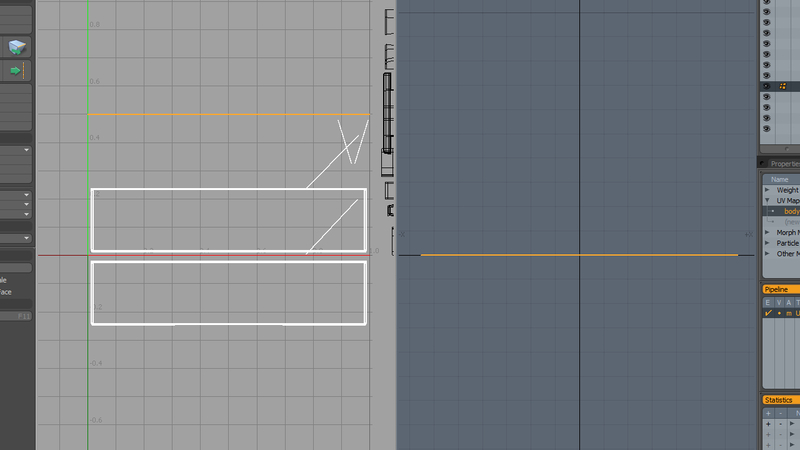 Before you deselect it, move it away because it's overlapping with the previously unwrapped front plane. 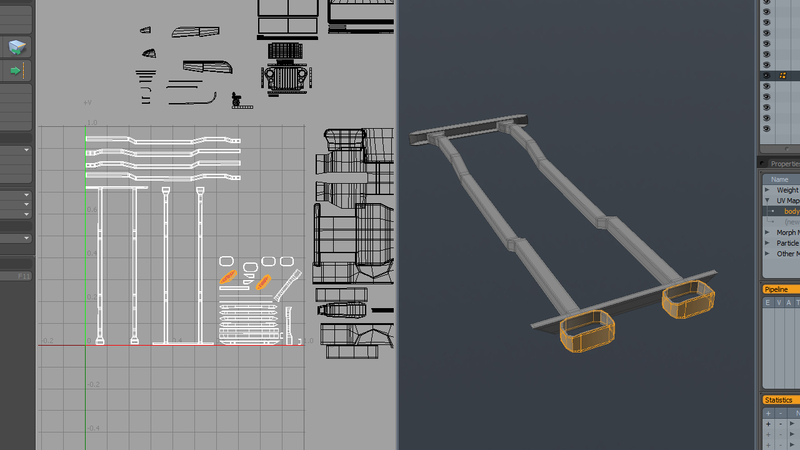 Now let's fix the long thin parts. Since I don't want to fix them by hand later, we will use the Working Plane and Project from View, to unwrap them perfectly. Select the polygons shown in the image (only the parallel ones). 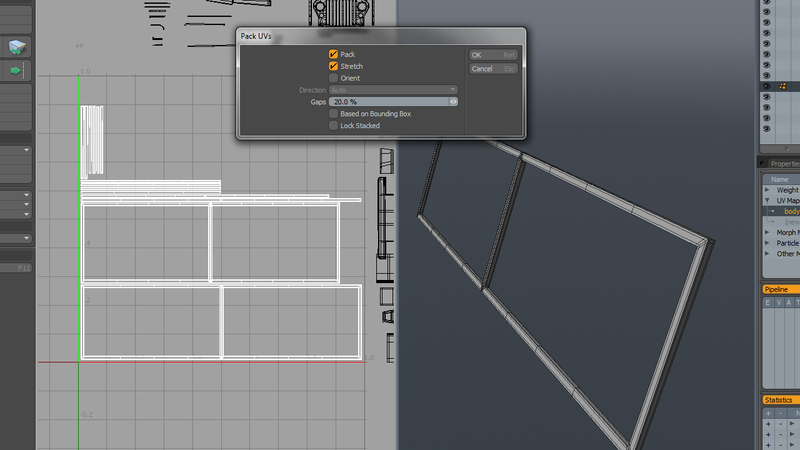 Next go to Snapping, and find the Work Plane menu, and choose the Align Work Plane to Selection option. 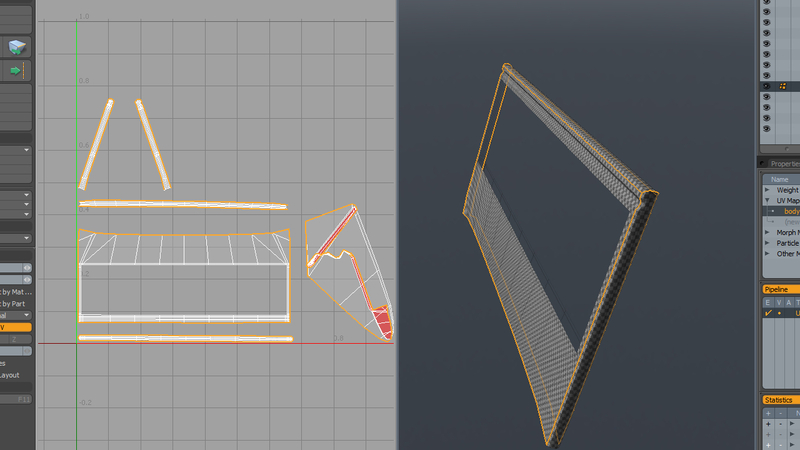 Now if you change your view to one perpendicular to those polygons (for me it was Front view), you can use the Project from View option, to project those polygons onto your UV Map, just like you would see them in the 3d viewport. Before you do that, be sure you have deselected any polygons not facing you. Two of the planes will face you from the Front View, and two won't. If you change to the Back view, the other pair will face you. 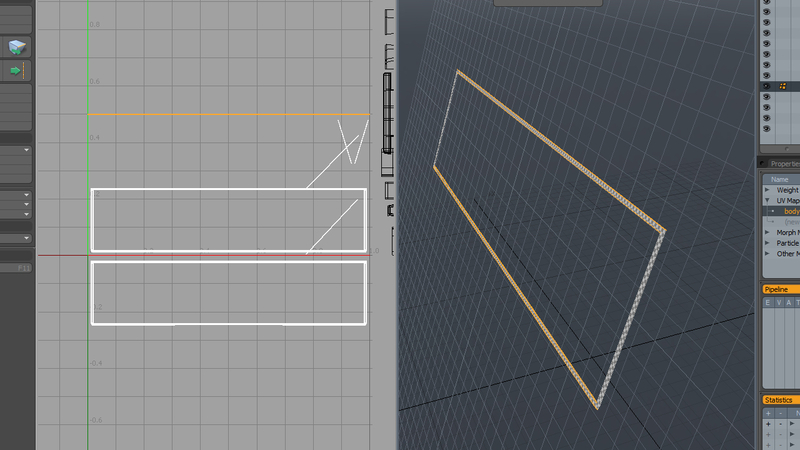 You still can unwrap the backfacing polygons, but the problem is that their directions will be inverted. Sometimes this may cause problems. So it's a good habit to avoid it. Also if you now unwrap them all at once, they will be overlapping, as you can see it in the picture. The long strip in the UV window is actually all four planes. Below you can see what's happening better. If you look at this piece from the top, only the first and third planes face you. The others are facing in the opposite direction. For me the most comfortable way of unwrapping something like this is to select all of the planes, and slowly deselect the ones I already unwrapped. 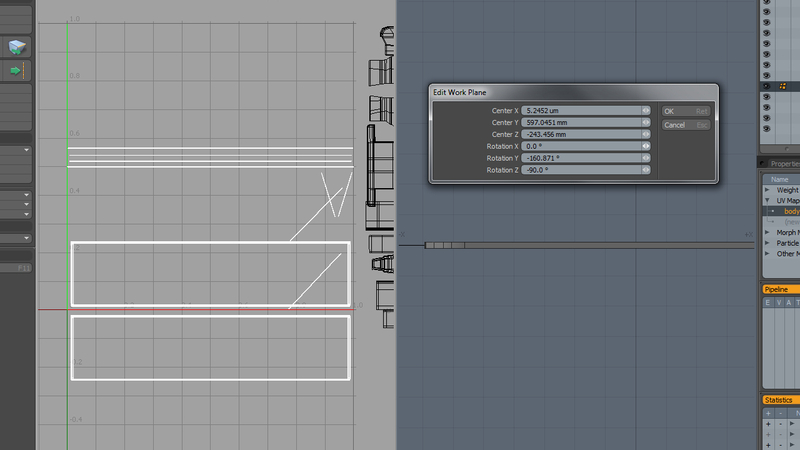 In the side view they are really small, but you can easily deselect specific planes. Here you can see that I unwrapped all of the planes with Projection from View, when I was in the Front view. 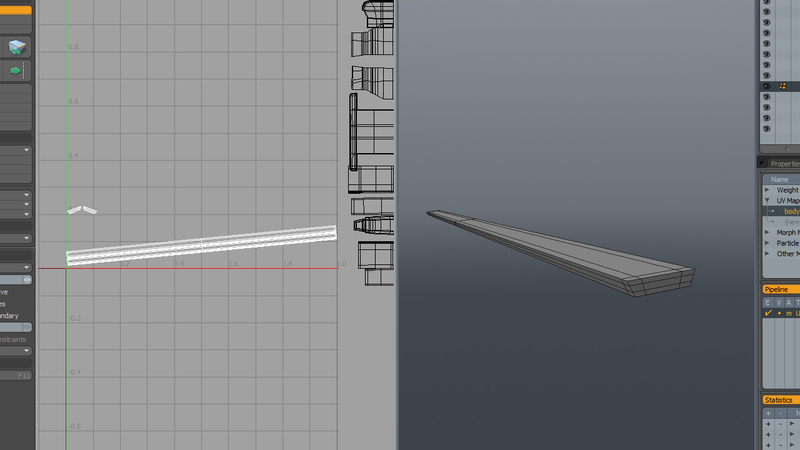 I changed to the Side view and deselected the top plane. I then moved up the remaining three in the UV window. 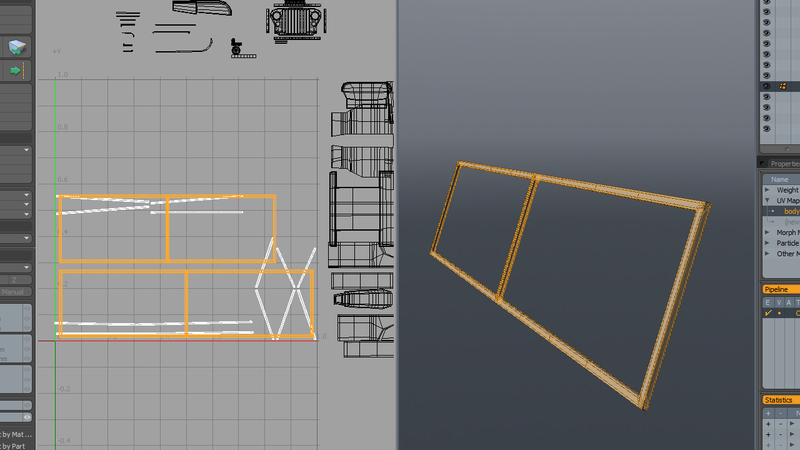 Now let's do the same for the side planes. 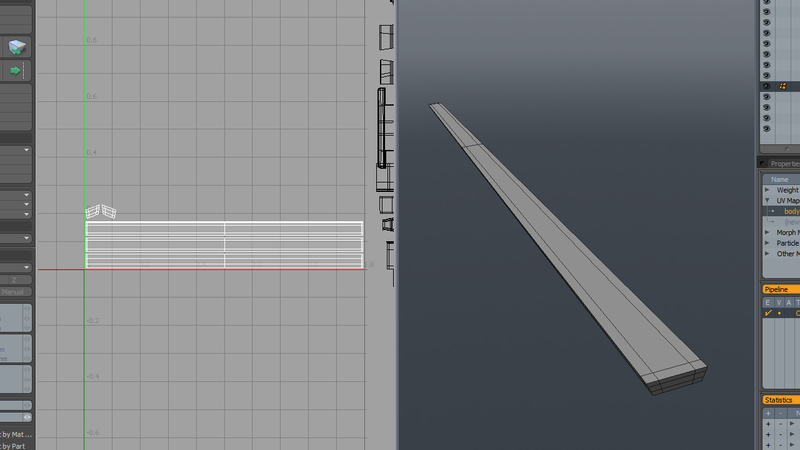 As you can see, I aligned my plane to this new selection and changed the view so it's perpendicular to those polygons. Unfortunately my view isn't really perfectly aligned. In the same menu we used before to align the work plane. You can find the Edit Work Plane option. It will give you specific information about the orientation and position of your work plane. As you can see in the image below, the Rotation X is a bit off from zero. So let's type a 0 in there. The Rotation Z also needed to be set to 90 degrees. Below you can see that our object is nicely aligned to the view. 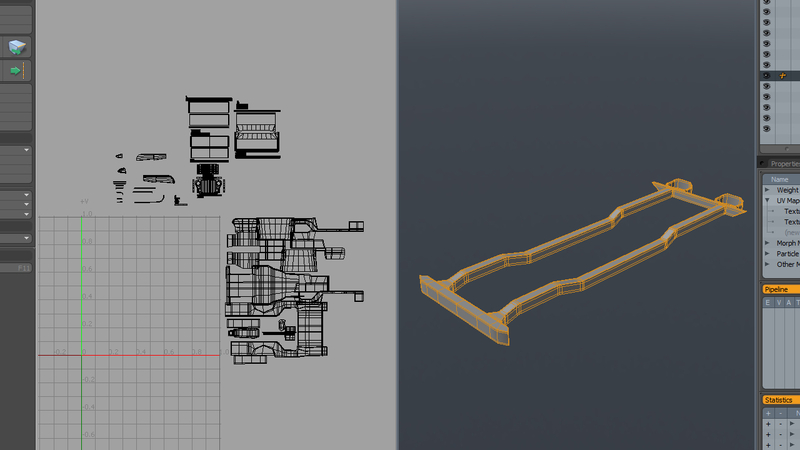 Using Projection From View now will give us really clean and flat UVs. Once again, remember about face alignment to the view plane. 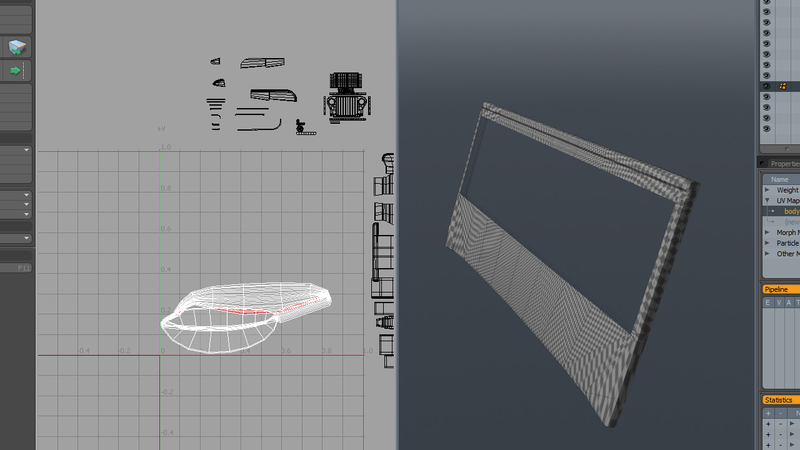 Just like before, I unwrapped each shell by changing the view and deselecting the unwrapped planes. 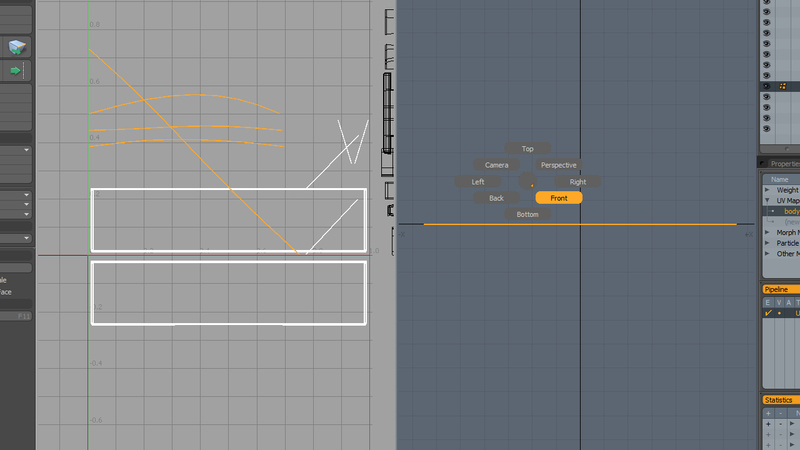 The Projection from View option fits the shell into the 0-1 space. 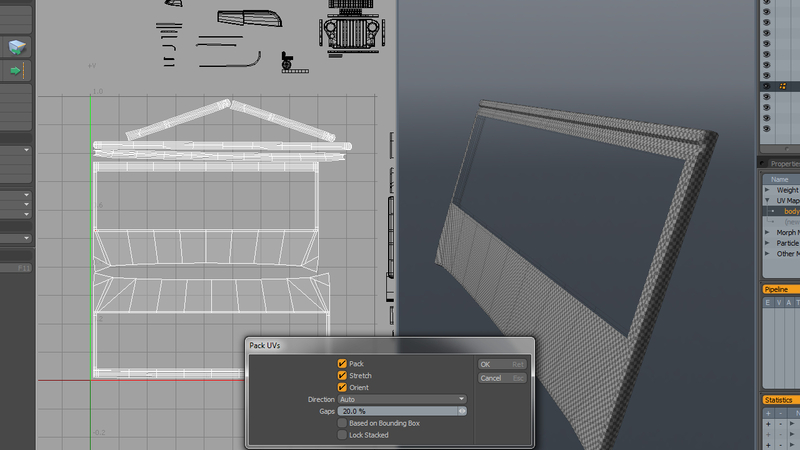 Select all the side pieces and Scale them down to match the height of the main shell. I Rotated them and placed them next to the main shell, to make this task easier. 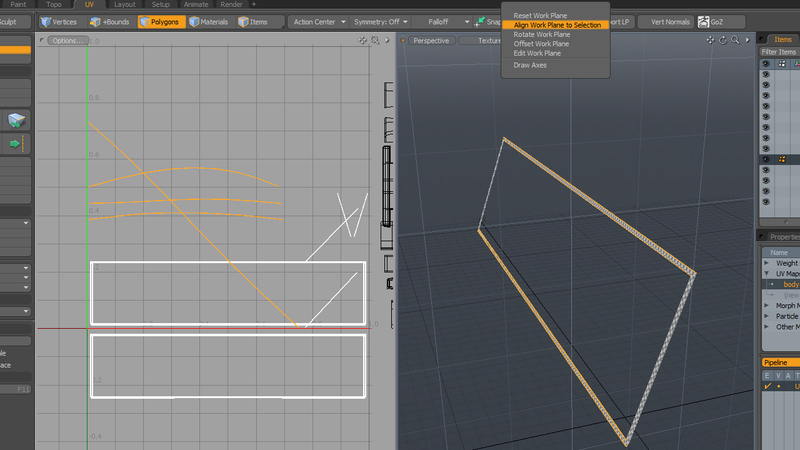 Just like before, you can stitch the side planes onto the main piece. Since you know already how to do that, I won't do it. For a piece like this it's not that important. If the rubber seal will be a black, matte surface the seams will be almost invisible. Remember that it's always easier to pack when you have less shells though. Let's continue with the rubber seal between the window and the hood. 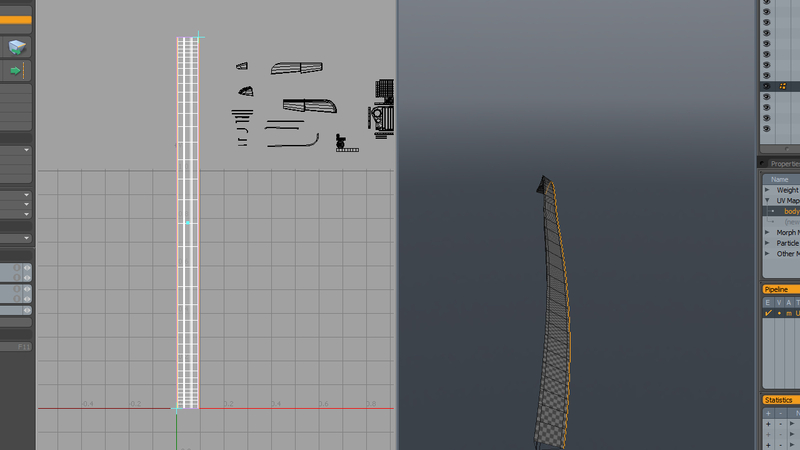 Since it's a long thin piece, we'll use the UV Peeler for this. Start by selecting the caps and using the Unwrap Tool. Hide those caps with H.
Select the whole loop running along the seal, and activate the the UV Peeler tool. Be sure that the edge you are selecting is the one you won't be able to see when the rest of the car is unhidden. 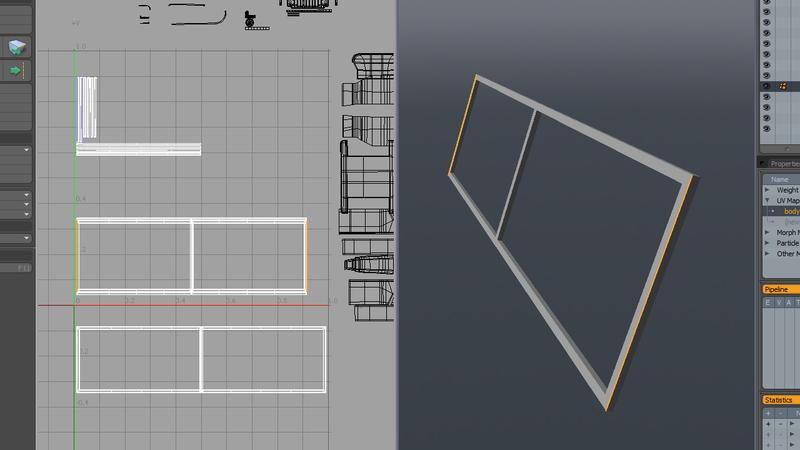 Using the UV Peeler gizmos, match the proportions in the uv window to those in the 3D viewport. 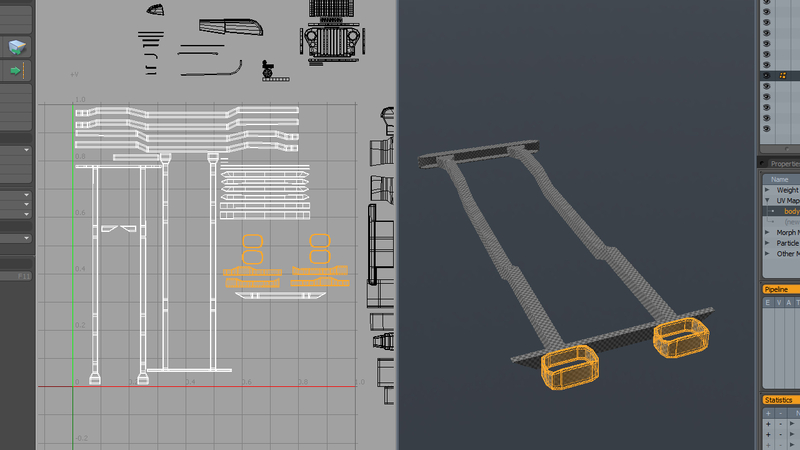 Using Pack UVs, match the scale of the caps and the rest of the geometry. Let's unwrap the main piece now. 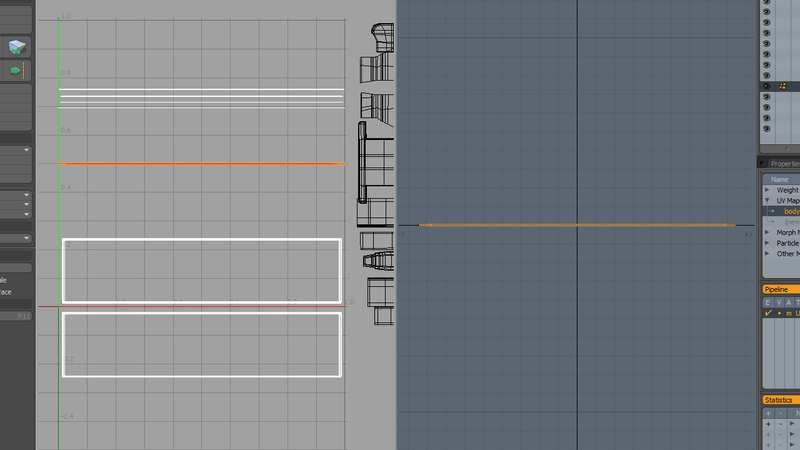 Isolate it by hiding the rest of the objects. We will slowly deconstruct the main piece into smaller chunks. 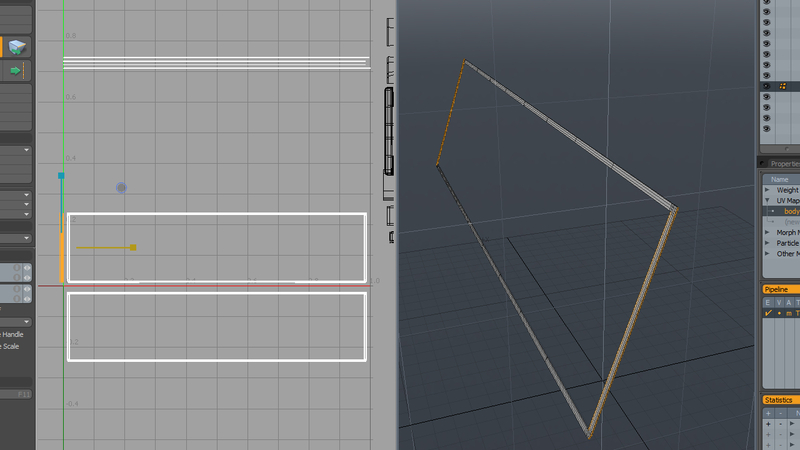 Select the corner edges and run the Unwrap Tool. We will get four shells. 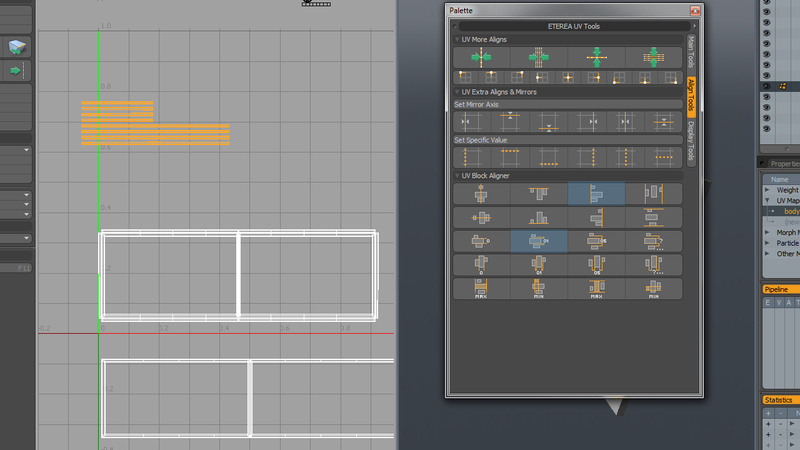 Using the ETEREAS scripts, align the shells and pack them together. Unhide the rest of the geometry and hide the unwrapped parts. 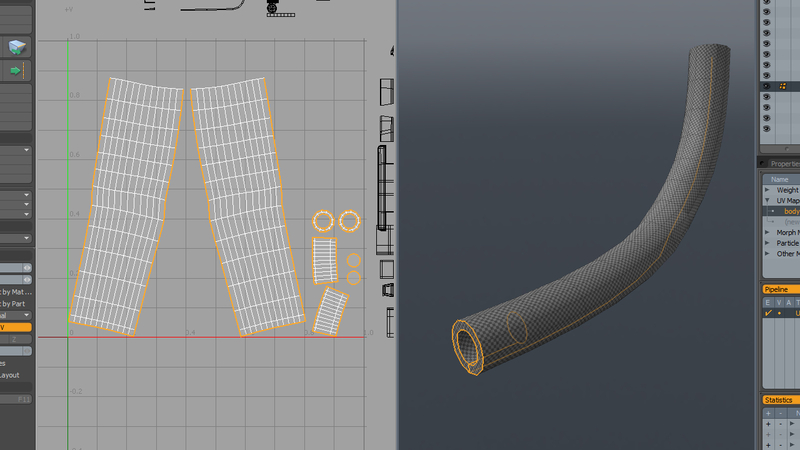 Select the loops around the cylindrical parts, and run the Unwrap Tool to separate the cylindrical parts on the UV map. With only this selection, Modo won't be able to unwrap these parts properly. 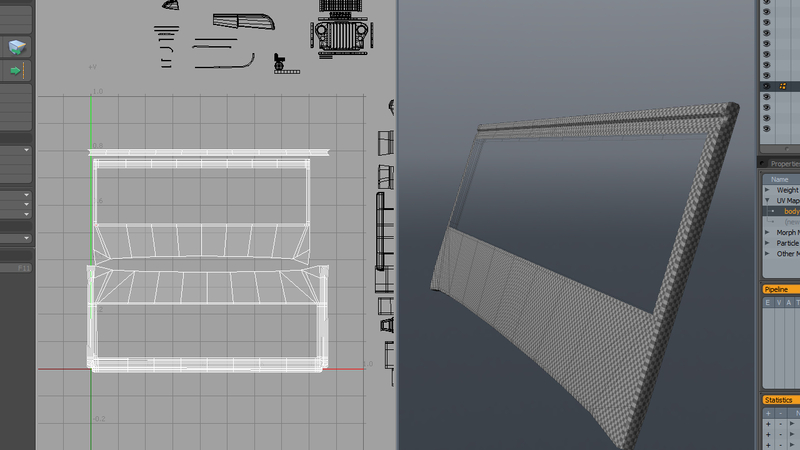 But for now we just want to separate these parts on our UVs. 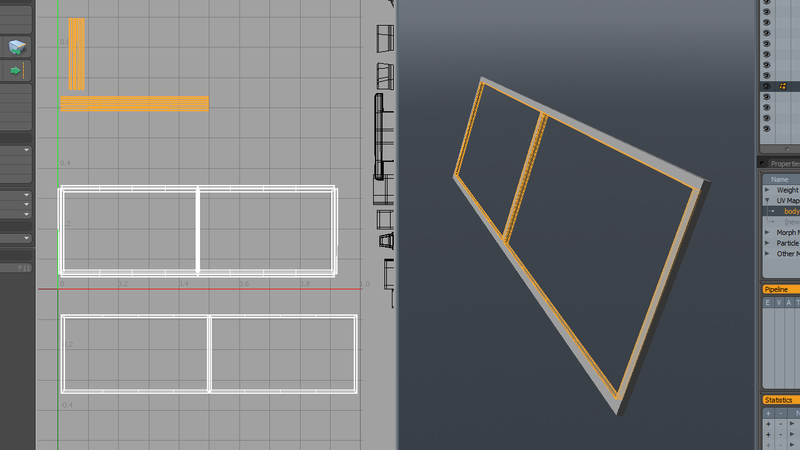 Select the cylindrical parts in the UV window and hide the rest. Now select the edges shown in the image below. If you activate the Unwrap Tool now, it should flatten this pretty well. 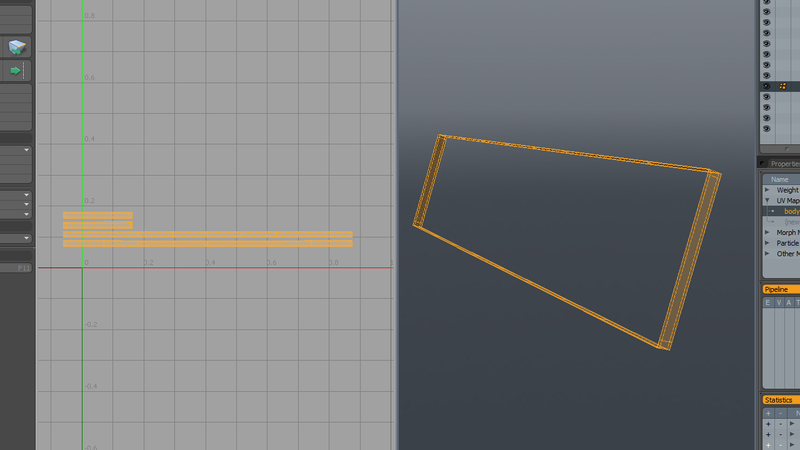 The cylindrical parts are pretty close to being simple rectangular UVs, but once again, I straightened the edges for better packing. The UV distortion is pretty unnoticeable. 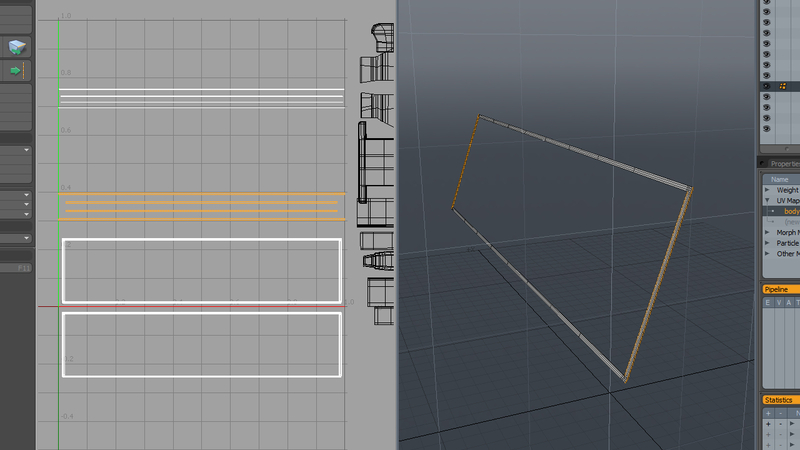 I also straightened the smaller, inner cylindrical parts. Do the same for the the rest of the geometry and place them somewhere close to the 0-1 space. 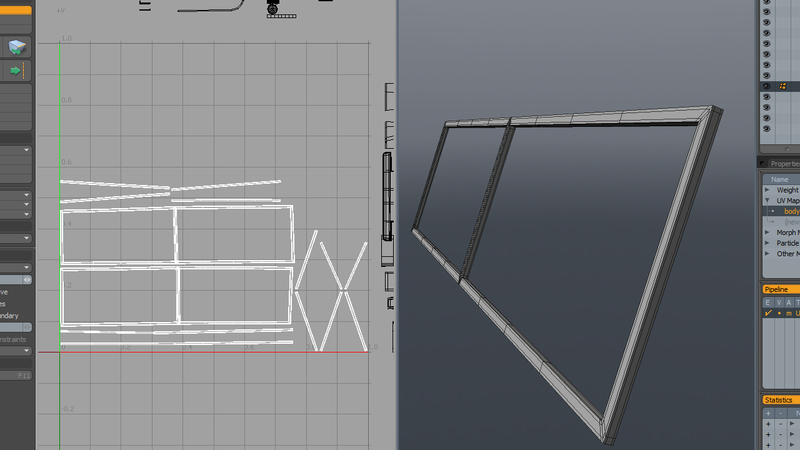 The final part of the window is actually close to a box shape. So let's break it into six main planes. 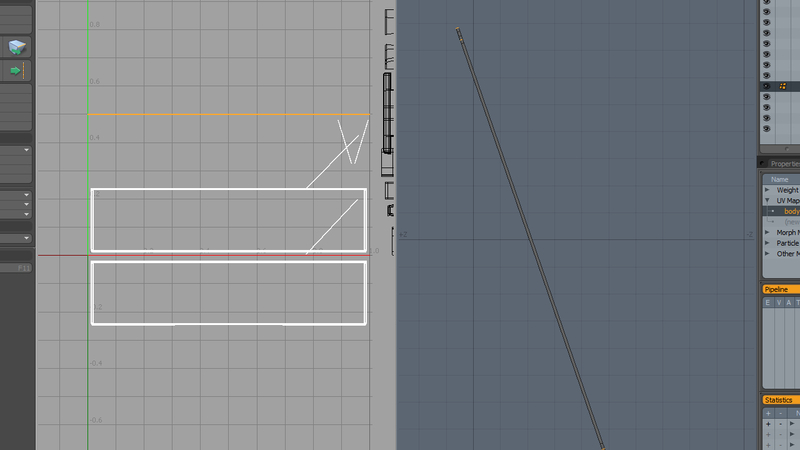 Select the corner edges and run the Unwrap Tool. As you can see in the following image, for me, the result isn't perfect. One of the planes is acting crazy, but the rest look pretty nice. 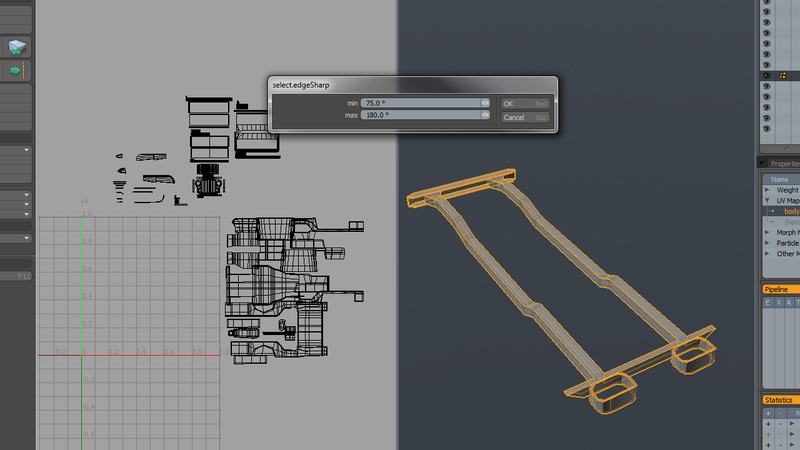 Double click the wonky UVs, and run the UV Projection Tool with Atlas. Run a Pack UVs to improve the texel density. As you can see, it still needs some hand tweaking. 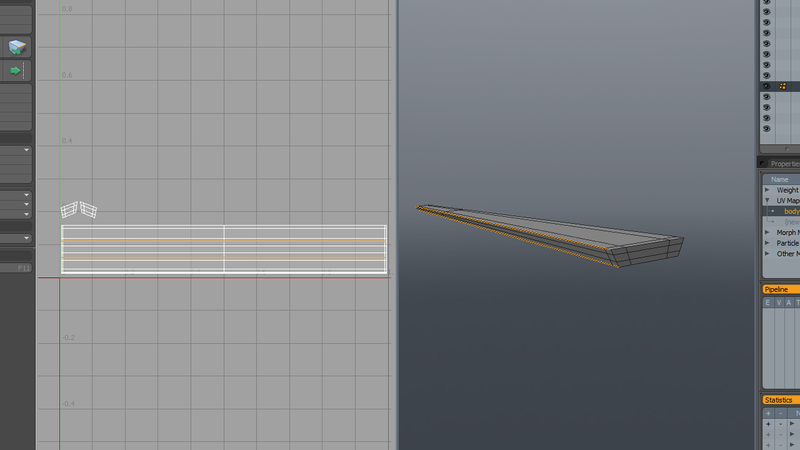 I also stitched the side planes onto the main one. It introduced some UV distortion, but you can always fix that with some manual tweaks, or by running a UV Relax on the specific vertices. Also straighten the edges on the remaining, unstitched part. 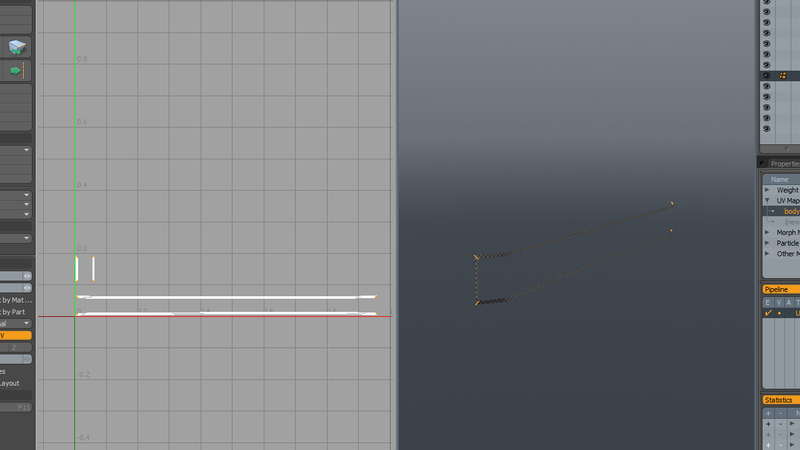 Be sure your UV shells scale is proportional to the rest of the UVs, and then move this part away. 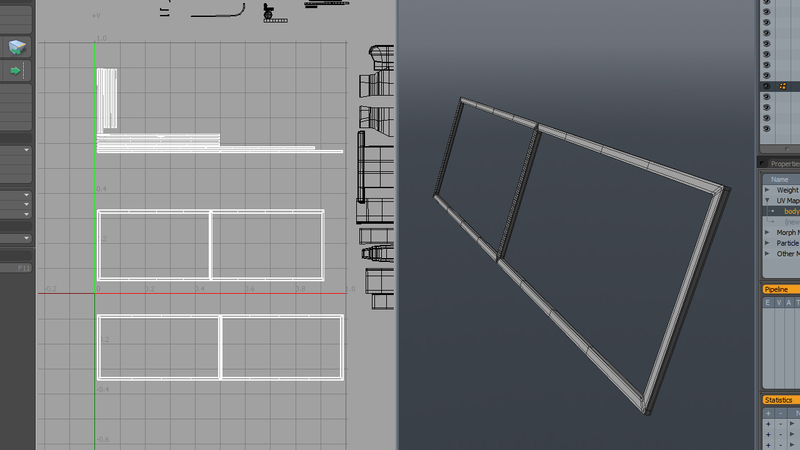 Lets continue by unwrapping the frame. It's made up of a lot of flat planes. The only parts that are a bit different, are those at the back end of the frame. 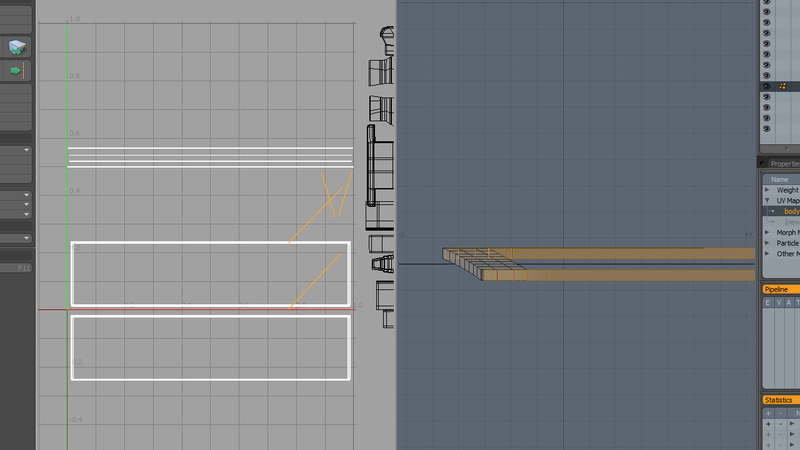 Remember to add a UV map. 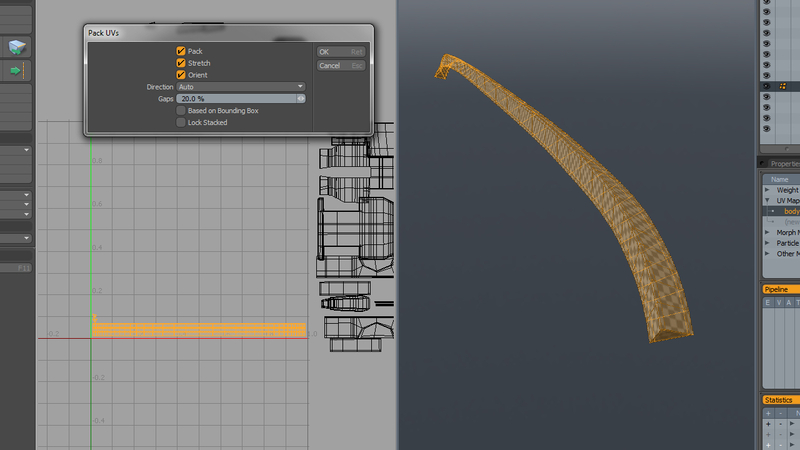 We will use the Unwrap Tool to start unwrapping, and for that we need a selection. I made mine by using the Sharp edges selection. Below you can see the settings I used. Remember to check if every loop is closed, or the automatic selection could miss something with these parameters. After activating the Unwrap Tool, I got a pretty good unwrap. The parts creating some problems are the ones I pointed out earlier. Below you can see those parts. 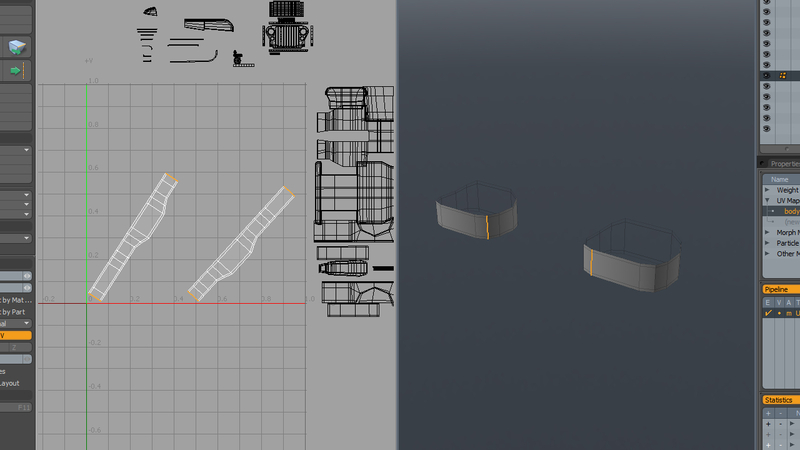 Those are cylindrical shapes without an edge selection, which would allow Modo to flatten them. We also have 4 "O" shaped shells, which aren't the best shapes to pack (or to texture) later. You can use the UV Peeler to straighten them. 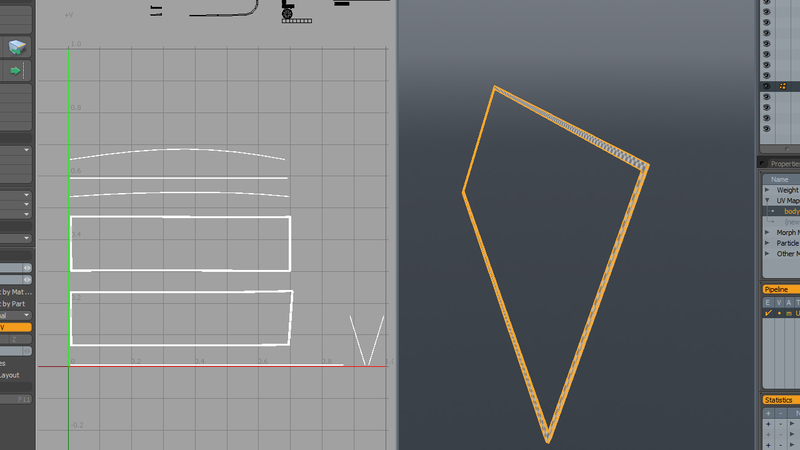 Since we already flattened some similar shapes, I won't do it again here. You can also leave them as is, and try to maximize the usage of your uv space later, by packing detail inside those shapes. 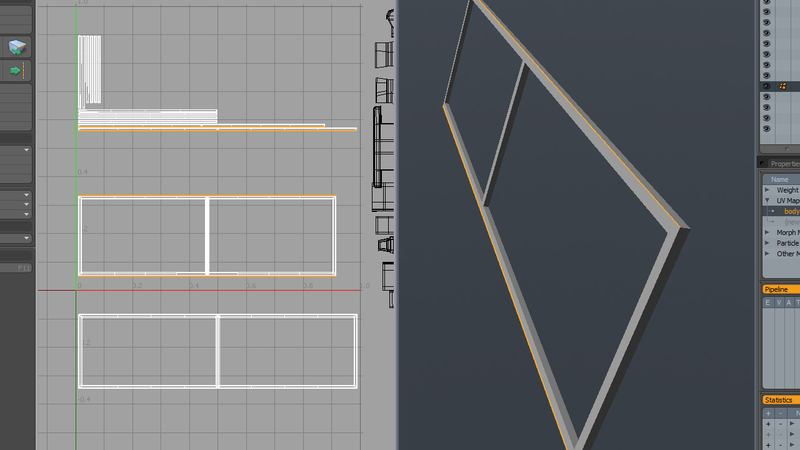 I also found out that some edges weren't perfectly straight, so I used the ETEREAS scripts to straighten those. 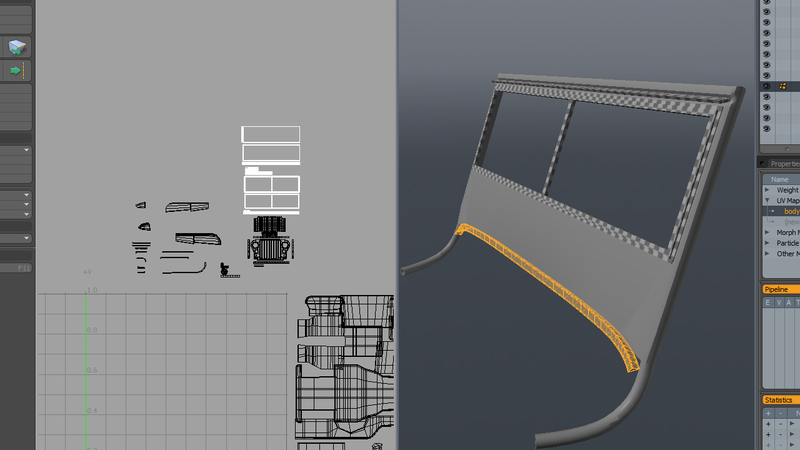 Try not to leave such things, it's worth taking care off them now rather than cursing when you're at texturing stage. The front bumpers parts are also not unwrapped the most efficiently. Those "C" shapes will make our life harder than it needs to be. 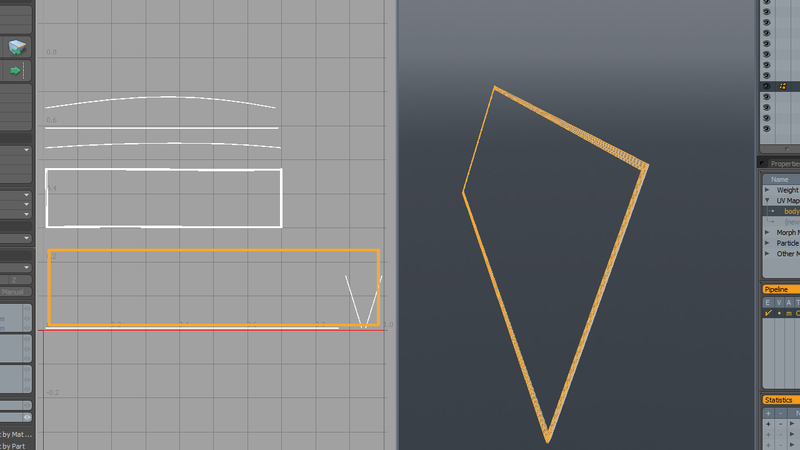 You can easily fix those, by isolating those polygons and using selection + Unwrap Tool. Breaking it on the corners will give you four shells, so be sure to straighten those. 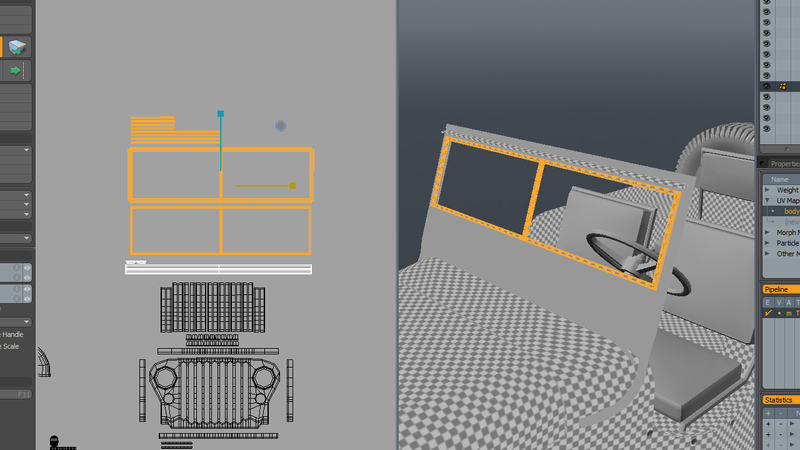 Pack them closely together, and place them close to the rest of the bumper UVs. 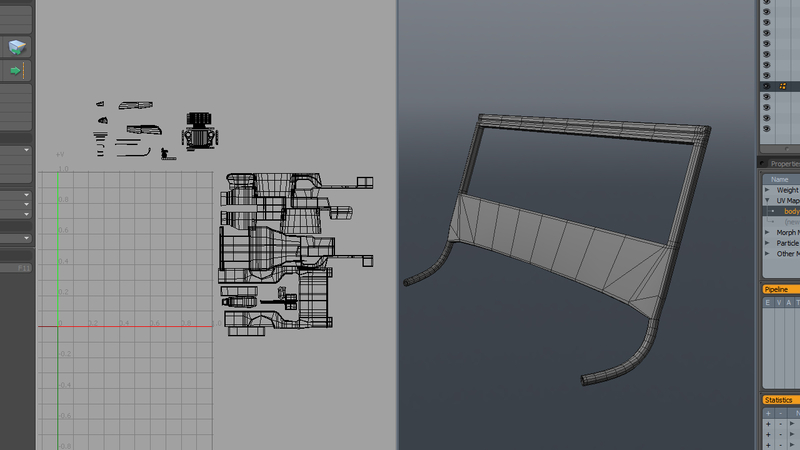 The bumper polygons are scattered though, so double-click on the bumper geometry in the 3D viewport. 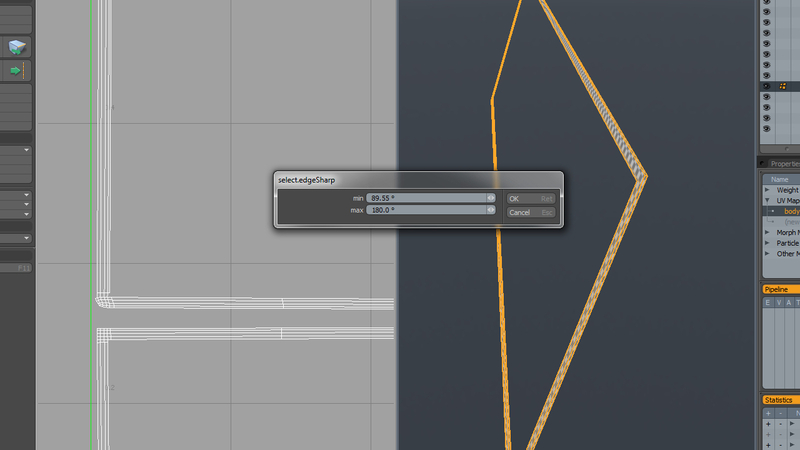 Using the Align scripts, pack them closely and align them logically. Let's also untangle where each of the back parts are. 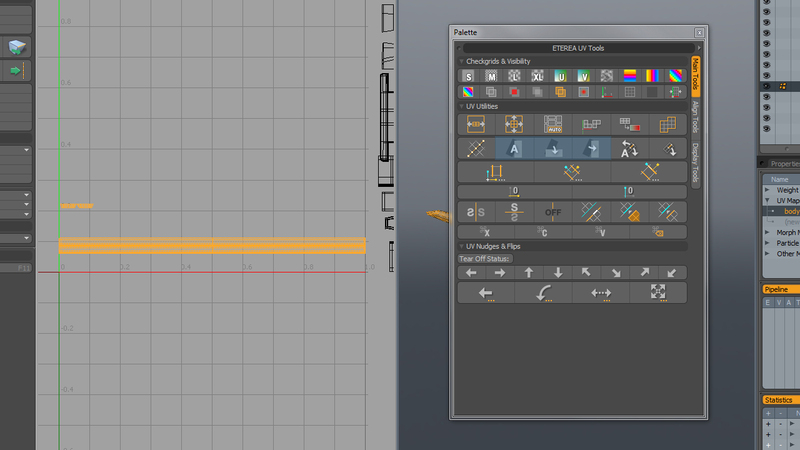 So select the "O" shapes and grow the selection in the 3D viewport. Move these parts away and place them next to each other. Be sure the corresponding parts are next to one another, and you didn't mix them up. For now move these away. Since the layout will change drastically when everything is unwrapped, there is no point in packing all of these shells right now. As you can see, the biggest parts are now unwrapped. And the Scale of the UV islands are pretty close to each other, which gives us a good texel density. You are now closer than further from finishing this unwrap. We've got some tricky parts in front of us, but with everything you learned, they should' t be hard to unwrap. Thank you for reading this tutorial. If you have any questions please leave a comment, or write me an email.